Several years ago, I received a Boye Needlemaster interchangeable needle set as a gift. 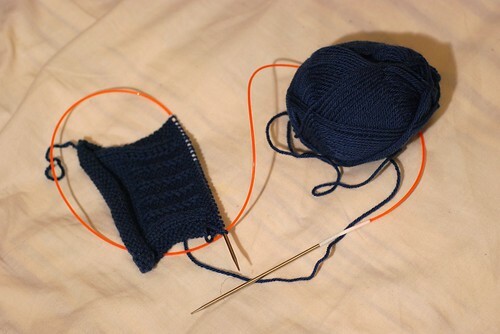 I was a newer knitter then, and I was thrilled to have every needle size from 2 to 15 at my disposal. The Needlemaster set isn't bad when it's the only thing you've got, but the cables leave something to be desired. They're rigid plastic with not much flex to them, even worse than usual craft-store circs, and they've got a weird bend at the ends of them. 2-56 screws. I got these headless screws called threaded studs (Sullivans brand) - as you can see, they cost me £4.40 for a pack of 20. If you can't find threaded studs, you can get regular 2-56 screws and cut the heads off. Tubing with an inner diameter of 0.075" and an outer diameter of .125". This can be bought in bulk online, but you can also scrounge materials from around the house - empty pen refills and Q-tip/cotton bud stems are about the same size. I took my tubes from Q-tips. All in all, it came to about £10. 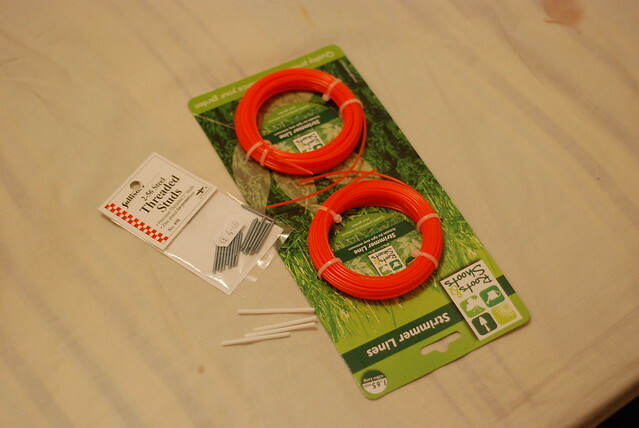 I have enough materials to make 10 needle cords, with plenty of weed whacker line and tubes left over. Assembly is pretty simple - screw the screws into the tube and glue the cords in the other end. Sand and file any rough bits (it's easiest to do this before you insert the cord). I opted for the threaded studs to avoid having to cut the screws, but if I did it again I would cut the threaded studs in half. You only need about 1/4" of screw exposed to screw in the needles, which means I had to screw the remaining 3/4 inch into the tube, which is kind of a pain. My method was this: screw a needle tip onto one end of the screw (choose a smaller size, because the large sizes screw in deeper than the small ones do, so if you do a large size you'll end up with a gap when you screw in a small tip), get something grippy (the Needlemaster set comes with a little black circular grip, this is handy) to grip the tube with, and screw it in. It will take some time and some elbow grease. Good luck. There are a few other Boye-hacking methods out there and lots of other tutorials. My favorite is Rheatheylia's. This is basically what I did except I used headless screws and Q-tip tubing. Another option, albeit more complicated, is "Boyepicks" hacking, which is converting Needlemaster tips to be used with Knitpicks Options/Knitpro cables. I thought about trying this, but it seems like a lot of extra effort and I'm OK with my weedwhacker cables. One method involves tapping the needle tips to change the threading - either taking them to a gunsmith or doing it yourself. If you've got spare KP cables, you can use tubing over the original screw and have Boye tips with KP cables. My favorite method, which I would like to try at some point, involves tapping an adapter so that you can screw one end into the KP cables, put a headless screw into the other end, and use it as a Boye/KP adapter. That way, you can use either set of tips with the cable, and either set of cables with the Boye tips! For the time being, though, I'm really pleased with my results. 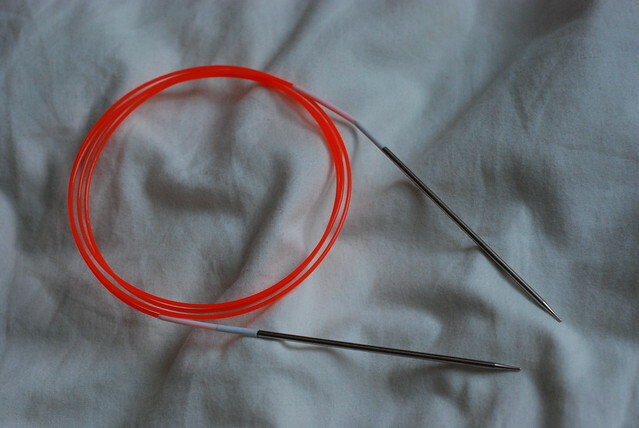 I can make myself custom-length cables that are nice and flexible to use with any of the 16 Needlemaster sizes. Not bad, eh? Where did you get the 2-56 screws in the UK? I didn't have any trouble finding them on eBay - under the name of Sullivan 2-56 Threaded Studs (headless screws).